Ingredients: Tomato paste 45%, red pepper paste 40% refined vegetable oil 6%, 5% sugar and spices. Sterilized product. Without preservatives and colorings! Net Weight - 310 grams. Homemade lyutenitsa, made by old Bulgarian recipe! Ingredients: roasted peeled peppers 60%, roasted peeled eggplant 5% tomato paste 30% refined vegetable oil, sugar, salt and natural spices Sterilized product. Without preservatives and colorings! Net Weight: 300 grams. 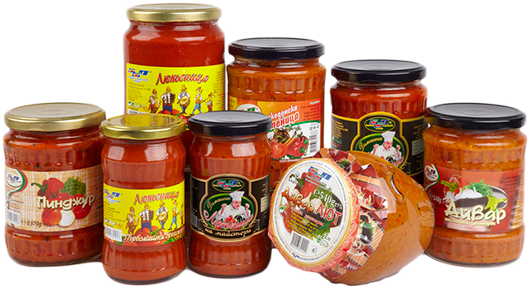 Lyutenitsa is a bulgarian traditional product made from both tomato and red pepper paste and spices! The quality of our concentrates (puree) is due to the original recipe and the use of fresh Bulgarian fruits and vegetables! In everyday life, when time is money , we offer to your attention several products that you can immediately serve on your table. Rediscover the original Bulgarian taste of our cans! 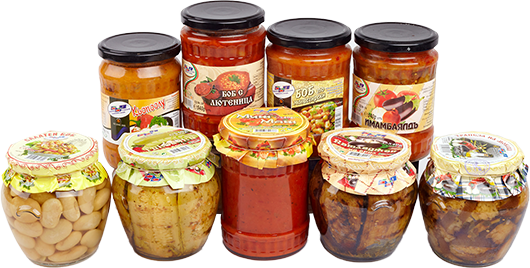 Company "BBP" Ltd. is a manufacturer of fruit-vegetable paste (puree), sterilized and canned vegetables and fruites, convenience foods and semi-manifactured foods. The factory was established in 1999. The production base of "BBP" Ltd. is located in town of Parvomay, Plovdiv district, situated in the Thracian Plain. The company uses Bulgarian raw materials in its production, and this is giving an unique and unforgettable taste of Bulgarian fruits and vegetables in their products.